Experience the winter wonderland of the north in our one of a kind ice fishing tour. We begin the fishing tour by driving for about an hour until we get to lake Kringluvatn or Langavatn. Lakes Kringluvatn & Langavatn are situated on a plateau so it is frozen over from December until March/April. 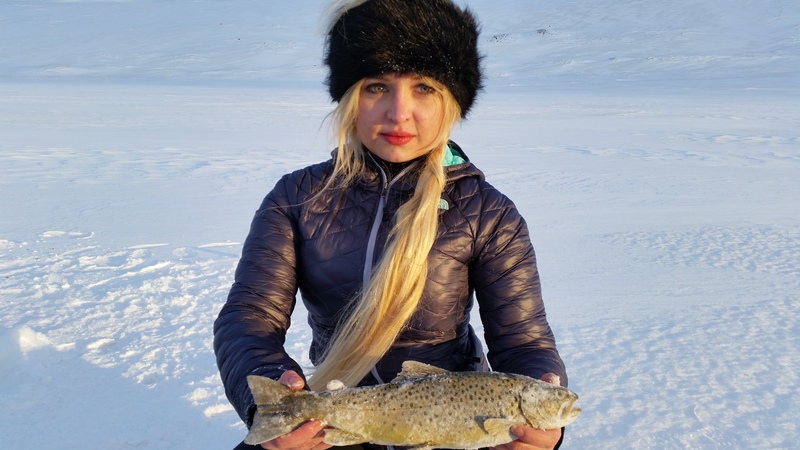 The lakes hold small arctic char and big brown trout and the odds are in your favor since it is not unusual to catch up to 15-20 char a day with the occasional huge brown trout. Getting to the lake can be hard during the winter time and it is essential to have a super jeep or a snowmobile. Duration: 6 hours 1 hour. We have a scheduled tour everyday at 09:00 and then we offer customized tours at any time of day or night.